Faith can move mountains and devotion can materialize miracles . Sai mother is bounded by our faith and love .The way our expression of love same way our Baba listens to us. One such story is of faith’s triumph over fate and Divine blessing of Shri Sai Baba. There was an ardent bhakt of Shri Sai Maharaj Smt Chandrabai Borkar.She resided in Ville Parle, her husband R.Borkar a Civil Engineer by profession .He was a skeptic and did not have any faith on Sai Baba.But he never resented or prevented her from going to meet Shirdi Sai Baba.Though he never visited Shirdi but Baba enveloped him in HIS grace. This could be felt by Chandrabai as she was often beforehand warned by Baba of any calamity that may befall her husband. Since he was in construction of bridges he had to be on tours and away from home. 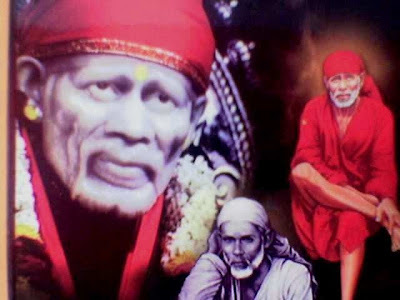 This made possible for Chandrabai to travel to Shirdi and spend time with Sai Baba.First time she visited Shirdi was in 1892, and she witnessed many divine leelas of Shri Sai Maharaj.Witnessing His leela strengthened her faith, love and devotion on Sai Maharaj many- many folds.When she visited Shirdi ,Baba would ask her to stay in some devotees home and would lovingly call her "Bai". After each Aarti Baba would give her udi and bless her, this udi she would safely keep it in a box and use it sparingly. But if someone was sick or in need she would readily give it. Like I had written about Kasibai who was blessed by Baba with HIS tooth same way Baba gave Chandrabai HIS tooth, which she made a talisman. This way Chandrabai visited Shirdi off and on for twenty years. In 1918 Baba asked her "Bai what is your heart's desire"? 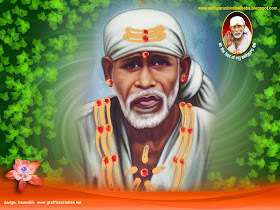 Chandrabai without hesitation replied "Baba you are Antaryami, what is there for me to tell you". She never told or asked Baba for a child but for this she yearned always.She was 48 and her friends,relative ,family doctors all declared that conception was impossible at her age.But Mrs Borakar was full of love,she was full of Faith and devotion (Shraddha and Saburi)and she knew well that NOTHING was IMPOSSIBLE with Baba. As time passed by her menses stopped. About 5 months later she noticed her tummy had bloated and she was vomiting and had swelling in her feet.There was a Doctor Shri Purandare who diagnosed her and told her she has tumor of the uterus ,and advised her surgery for its removal .But Bai was determined and had full faith in and said "I will bide my ten months and then decide". Dr explained her over and over again that at her age of 51 without conception for so many years pregnancy is impossible but Bai was determined and adamant .She knew that Baba's grace would make everything impossible possible.During that period her physical condition deteriorated. She resorted to taking Udi and water only for months. She was blessed on Dhanatrayodashi with a son , just after 3 years 2 days of Baba's Mahaniryan. She not only carried her pregnancy well she also continued to do her house hold chores up to the time of delivery. To the surprise of every one it was a safe and easy delivery, without the aid of a doctor, nurse or any medications. Who can argue and prove this anything less than Baba's kripa on her Bhakt.All logic,knowledge,arguments,intellect failed and faith triumphed over the Fate. Here a beautiful vachan (saying from Baba's 11 vachan ). JO JO MAJA BHAJE JAISA JAISA BHAVE THAISA THAISA PAVE MEIN HE TYASE . I must acknowledge that you are doing a great jobs. The best thing about your posts are that, every storey you tell through these, gives a feeling of deep devotion and sprituality. The narration is not bulit up but these are the expression of free flowing bhakti of a true devotee. May Sai Ma bless you and give you all encouragement to continue the SAI SEVA. After reading the story of Chandrabai.."Faith Triumphs Over Fate" I feel more confident to see the world which is full of problems. I strongly believe that firm faith on Baba will make us successful and give us much peace which words can't describe. Love you Baba very very much. Om sai ram.